Pakistan’s top diplomat in India has said that the leader of a prominent Pakistan-based militant group is not being held in Pakistan. 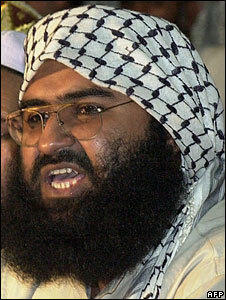 Earlier this month, Pakistan said it had arrested Masood Azhar, founder of the Jaish-e-Mohammad militant group. Pakistan’s high commissioner to India, Shahid Malik, has now said Pakistan has no information about his whereabouts. Mr Azhar is one of the most wanted men in India. He is on a list of people Delhi has demanded Pakistan hand over. “As far as I know [the report about Mr Azhar’s house arrest] is wrong. He is not in Pakistan. We don’t know where he is,” Mr Malik said. Earlier this month, Pakistan Defence Minister Mukhtar Ahmed said Mr Azhar had been placed under house arrest as a part of a crackdown following the attacks on Mumbai (Bombay). Jaish-e-Mohammad is accused of taking part in the attack on India’s parliament in 2001, along with the group Lashkar-e-Taiba, which brought the two countries to the brink of war. Last week, Pakistani Prime Minister Yousuf Raza Gilani said he had “yet to receive any report” of Masood Azhar’s detention, contradicting what his defence minister had said. In 1999, Mr Azhar was freed from an Indian prison in exchange for passengers on a hijacked Indian Airlines jet. He set up Jaish-e-Mohammad in early 2000, shortly after being set free by India. In his TV interview, Mr Malik also said that Dawood Ibrahim, blamed for serial bombings in Mumbai in 1993 that left at least 250 dead, is “not in Pakistan”. Mr Ibrahim also features in the list of 20 fugitives that India reportedly wants Pakistan to hand over. Pakistan has held two militants of another Pakistan-based Kashmiri militant group, Lashkar-e-Taiba, that India says was behind the deadly attacks in Mumbai. Pakistan has been under intense pressure to act after the attacks, which left at least 170 people dead. You are currently browsing the archives for the Dawood Ibrahim category.